Pixel Mine on Tuesday announced the release of Underworlds, a fantasy adventure game for the iPhone and iPod touch. It’s available from the App Store for for $5. 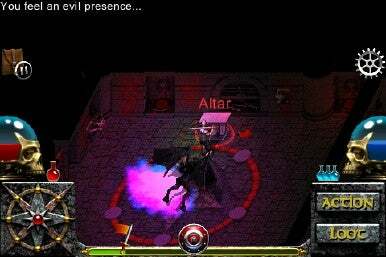 Underworlds is a classic “dungeon crawl”-style action adventure game featuring monsters, magic users, swords and sorcery. Akin to Diablo and classic computer RPGs like Wizardry and Ultima, in Underworlds you assume the role of a guard of a traveling caravan who is suddenly thrust into a life-or-death struggle against the forces of Hell. You gain experience and learn powerful offensive maneuvers, collect health potions and vitality boosts, and upgrade your existing capabilities or add new ones. You can focus on becoming a powerful warrior, improve your dexterity, add to your intelligence and more. The game features four difficulty settings, thousands of unique armor and weapons items, hidden traps and treasures, two different control schemes, the ability to save at any time, and a random generator that guarantees you that you never play the same way twice.